The FX Moderator is used to reduce the report of your air rifle making it backyard friendly. 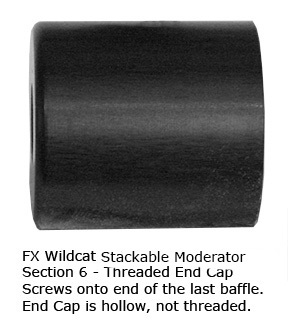 This End Cap (section 6) is added to the baffle or base sections to cap your moderator for a clean look. This is a caliber specific unit for the FX Stackable Moderator. This section attaches to the Base unit (section 1) or the Baffle section (middle section). Order your end cap based on the caliber of your gun. FX Wildcat .25 ships with the base section (section 1) and the end cap (section 6) of the moderator. You only need this section if you need a replacement for your original End Cap section 6. Note this moderator is made for and fits the FX Wildcat moderator system. 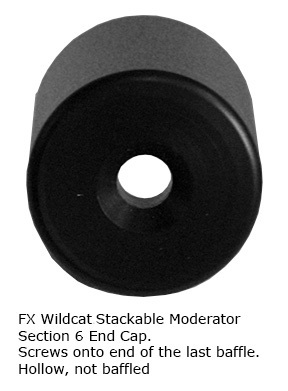 ** This moderator will fit the FX Wildcat .177, .22 and .25 and must thread onto the Base (section 1 or the Middle baffle section. This moderator will not fit the Wildcat .25 Compact or Wildcat .30 which use the Impact moderator.